The threat of inflation is nothing like the double-digit affair of the 1970s, but it's still there. Dormant for years, inflation may seem irrelevant, but it remains a risk. Here's a short lesson for managing this risk. 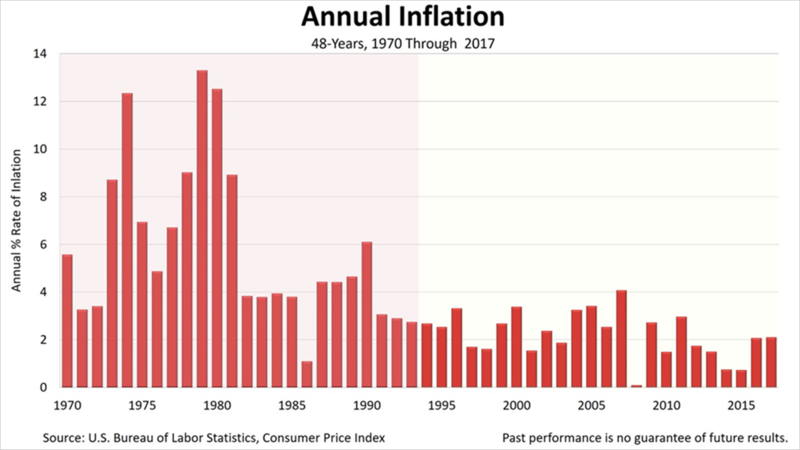 In the 48 years after it raged in 1970, inflation was a tale of two times, distinctly different but equal in length. The first 24 years was a high-inflation period and low inflation marked the last 24 years. The median Consumer Price Index, a widely-watched inflation barometer, was 3.8% for the 48-year span. However, the CPI topped 3.8% just once in the past 24 years, while hitting 3.8% or higher in 18 of the previous 24 years. 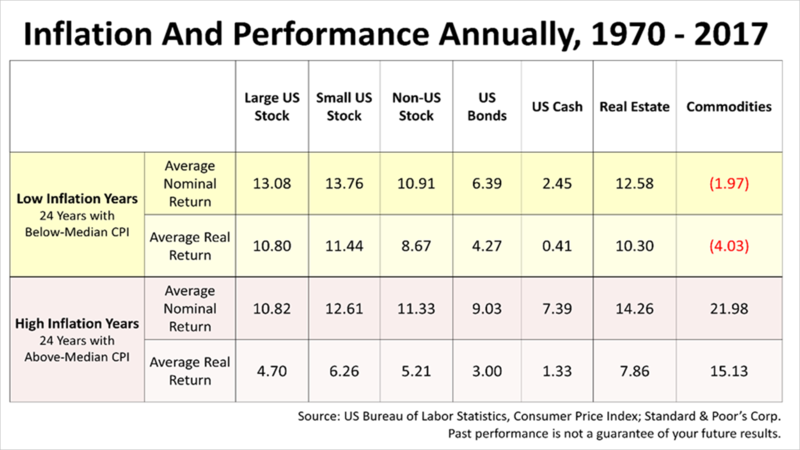 Large U.S. stocks' nominal return in the low-inflation era was 13.08% and, after subtracting the small CPI increase, 10.8%. In the high-inflation years, a 10.8% nominal return shrunk to 4.7% after inflation. High CPI slashed real returns after inflation in half, a frightening risk to a retiree on fixed income. Stocks held up well in low-inflation times, because bonds - their chief competitor for investor capital - were yielding less income. Stocks performed okay in high-inflation periods, too. An escalating CPI eroded the value of bonds' interest income. Longer-maturity bonds suffered. Money market instruments are never big interest payers. But shorter-term income investments go up with inflation. They've been good for times of rising inflation. Real estate performed well in low-inflation years, which foster lower mortgage payments that encourage home buying. Yet real estate also performed in the high inflation era. A real wild card for investors in securities over the last 48 years was commodities. Oil companies dominate commodities in this class of securities, but it also reflects prices of gold, food and raw materials. Historically, prosperity increased demand for goods and boosted commodities prices. Low inflation meant the opposite happened. It's easy to think commodities are irrelevant, but long-term financial history indicates otherwise. The fact that they were losers after years of good stock returns demonstrate why they remain important in a diversified portfolio. If you did not have some investments underperforming, you're not properly diversified. This article was written by a professional financial journalist for Davis & Wehrle, LLC and is not intended as legal or investment advice.